One of the most delightful birdsongs you hear when strolling over the green open spaces or alongside the creeks of Pittwater is that of the Willy Wagtail. They can sometimes get quite noisy, especially this time of the year as they head into their breeding season, when disputes over territory, from which humans are not immune, cause their sweet twitters to get a little more raucous, insistent and even scolding. When not scolding they have a pleasant melodious range of songs communicating or calling to their mate. In his book What Bird is That? (1935), Neville Cayley writes that it has "a pleasant call resembling sweet pretty little creature, frequently uttered during the day or night, especially on moonlight nights"
Willy Wagtails are seemingly unafraid of us and will flit in your tracks scooping up insects you have disturbed from the grasses or perch on any near post and eye you without fear. Willy Wagtails will harrass not only small birds but also much larger by comparison species like the Australian Magpie (Gymnorhina tibicen), Raven (Corvus coronoides), Laughing Kookaburra (Dacelo novaeguineae), and even the giant’s of the bird world, Wedge-tailed Eagles (Aquila audax). Some have been known to attack domestic dogs, cats and humans which approach its nest too closely. In Western Australia they have been observed harassing snake-neck turtles and tiger snakes. When harassing an opponent, the Willie Wagtail avoids the head and aims for the rear. Both the male and female may engage in this behaviour, and generally more intensely in the breeding season. Territories range from 1–3 ha (2–7 acres) in area. A pair of birds will declare and defend their territory against other pairs in a diving display. One bird remains still while the other loops and dives repeatedly before the roles are reversed; both sing all the while. They are the largest and most well know of Australian fantails. Their name stems from their habit of wagging their tail from side to side as they flit over lawns and watercourses scooping up a meal. They will wag their tail feathers even when waiting to dive off onto another insect from a perch. Their plumage is black above with a white belly and are distinguished from other similar-sized black and white birds by their black throat and white eyebrows and whisker marks. Younger Willy Wagtails will have a rust edge to their feathers. The Willie Wagtail Willie (or Willy) Wagtail (Rhipidura leucophrys) a passerine bird, was first described by ornithologist John Latham in 1801 as Turdus leucophrys. Its specific epithet is derived from the Ancient Greek words leukos "white" and ǒphrys "eyebrow". Other early scientific names include Muscicapa tricolor by Vieillot, and Rhipidura motacilloides by naturalists Nicholas Aylward Vigors and Thomas Horsfield in 1827, who erected the genus Rhipidura. The generic term is derived from the Ancient Greek rhipis "fan" and oura "tail". John Gould and other early writers referred to the species as the Black-and-white Fantail, although did note the current name. However, Willie Wagtail rapidly became widely accepted sometime after 1916. 'Wagtail' is derived from its active behaviour, while the origins of 'Willie' are obscure. The name had been in use colloquially for the Pied subspecies of the White Wagtail (Motacilla alba) on the Isle of Man, and Northern Ireland. Australian vernacular names applied include Shepherd's Companion (Willy Wagtails will be found frequently in the company of sheep and cattle, perching quite happily on their backs and getting a ride to the next patch of insects disturbed by their hooves or drawn in by their dung. ), Frogbird, Morning Bird, and Australian Nightingale. Many of their aboriginal names are onomatopoeic, based on the sound of its scolding call. Djididjidi is a name from the Kimberley, and Djigirridjdjigirridj is used by the Gunwinggu of western Arnhem Land. In Central Australia, southwest of Alice Springs, the Pitjantjatjara word is tjintir-tjintir(pa). Among the Kamilaroi, it is thirrithirri. In Bougainville Island, it is called Tsiropen in the Banoni language from the west coast, and in Awaipa of Kieta district it is Maneka. In Solomon Islands Pijin it is sometimes called the polis (police) or pris (priest) bird, because of its black-and-white colouring. The Wagtail's nest is a neatly woven cup of grasses, covered with spider's web on the outside and lined internally with soft grasses, hair or fur. The soft lining of the nest, if not readily available, is often taken directly from an animal, thus the lingering around our livestock or their happy habitation of where we walk our dogs. Their nests may be re-used in successive years, or an old nest destroyed and the materials used in the construction of a new nest. Nests are typically placed on a horizontal branch of a tree. Their eggs are cream-coloured, speckled with grey and brown are incubated by both sexes. The young birds will stay with their parents until the eggs from the next clutch start to hatch. At this point they are driven away. If conditions are favourable, the couple may raise up to four successive clutches in a single season. Rafters and eaves may also be used. Willy Wagtails have been noted building their nests in the vicinity of those of the Magpie-lark (Grallina cyanoleuca), possibly taking advantage of the latter bird's territoriality and aggression toward intruders. Similarly, it is not afraid to build near human habitation. The bird world of the Willy Wagtail seems to mirror the human world in some ways; the female Pallid Cuckoo (Cuculus pallidus) has been known to lay eggs in a Willie Wagtail nest, although the hosts often recognise and eject the foreign eggs, so successful brood parasitism is rare. Parasitism by the Fan-tailed (Cacomantis flabelliformis), Brush, (C. variolosus), Horsfield's Bronze (Chrysococcyx basalis), and Shining Bronze Cuckoo (C. lucidus) have also been reported. They are found throughout Australia, excepting the island of Tasmania and also reside in New Guinea, the Solomon Islands, the Bismarck Archipelago and the Moluccas. Wagtails are a member of the fantail genus Rhipidura and is a part of a 'core corvine' group that includes true crows and ravens, drongos and birds of paradise. Within this group, fantails are placed in the family Dicruridae, although some bird experts consider them distinct enough to warrant their own small family, Rhipiduridae. 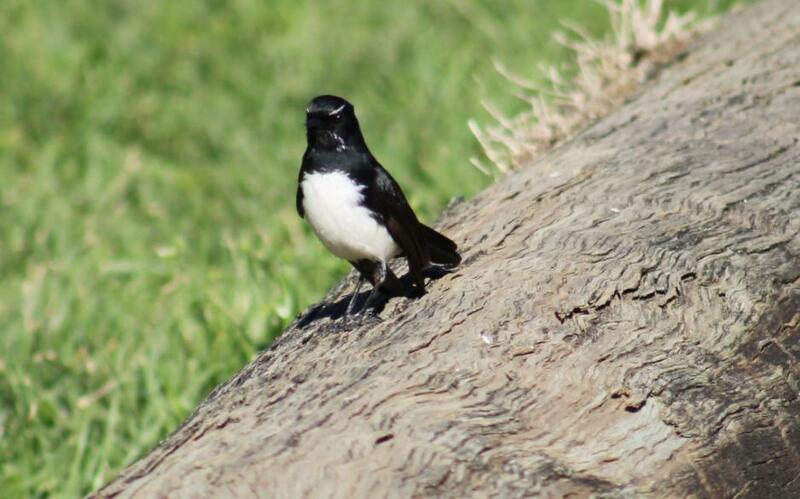 The Willie Wagtail was a feature in Australian aboriginal folklore. Aboriginal tribes in parts of southeastern Australia, such as the Ngarrindjeri of the Lower Murray River, and the Narrunga People of the Yorke Peninsula, regard the Willie Wagtail as the bearer of bad news. It was thought that the Willie Wagtail could steal a person's secrets while lingering around camps eavesdropping, so women would be tight-lipped in the presence of the Willie Wagtail. The people of the Kimberley held a similar belief that it would inform the spirit of the recently departed if living relatives spoke badly of them. They also venerated the Willie Wagtail as the most intelligent of all animals. Its cleverness is also seen in a Tinputz tale of Bougainville Island, where Singsing Tongereng (Willie Wagtail) wins a contest among all birds to see who can fly the highest by riding on the back of the eagle. However, the Gunwinggu in western Arnhem Land took a dimmer view and regarded it as a liar and atattletale. He was held to have stolen fire and tried to extinguish it in the sea in a Dreaming story of the Yindjibarndi people of the central and western Pilbara, and was able to send a strong wind if frightened. The Kalam people of New Guinea highlands called it Konmayd, and deemed it a good bird; if it came and chattered when a new garden is tilled, then there will be good crops. It is said to be taking care of pigs if it is darting and calling around them. It may also be the manifestation of the ghost of paternal relatives to the Kalam. Called the Kuritoro bird in New Guinea's eastern highlands, its appearance was significant in the mourning ceremony by a widow for her dead husband. She would offer him banana flowers; the presence of the bird singing nearby would confirm that the dead man's soul had taken the offering. Alone, on a rocky ridge high in the mountains, a wallaroo made his camping-ground beneath the shady boughs of a mountain ash. He was very old and infirm, and too weak to hunt for food, so he sat by his camp fire all the day and lashed the ground with his strong tail. The low, rhythmic thud-thud-thud of its beating could be heard above the song of the birds. One day a paddymelon was passing close by the camp when he heard the beating of the wallaroo's tail. After following the direction of the sound, he came to the camp, and asked the wallaroo if he was in trouble. "I am very sick," the wallaroo replied. "Many times have I seen the snow on the mountains, and I am growing too old to hunt. My brothers have gone to the river beyond the hills to spear fish for me, but they have not returned, and I am very hungry." The paddymelon was sorry for the old wallaroo, and offered to go to the river in search of the fishermen. He walked a short distance from the camp when the wallaroo, called after him: "You had better take my boomerang with you, as you may meet some game on your way." The paddymelon turned around and said: "All right, I shall take it. Throw it to me!" The crafty wallaroo picked up the boomerang, and, taking careful aim, threw it with all his strength. It struck the unfortunate paddymelon a terrible blow and killed him. The wallaroo took the fur from the dead animal and prepared the body for cooking. He dug a hole in the ground, lined it with stones, placed the meat in it, and covered it with flat stones. He then built a fire over it, and in a short time had cooked a tasty meal.